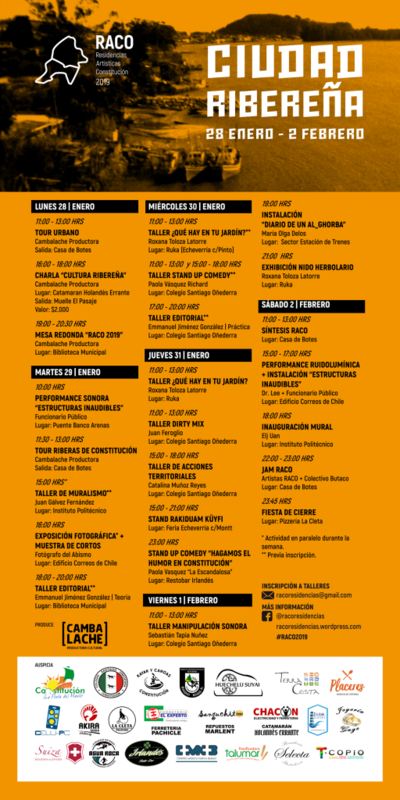 Constitución Artistic Residencies (RACO) begins this Monday 28 a new version. For this year a wide range of activities have been prepared in which tours, talks, exhibition and creation of pieces, edition workshops, murals, stand-up comedy, performance and sound art. At Arte Al Límite we had a conversation with Leticia Zapata, Raco producer, artistic residencies program in the city of Constitución which is developed until February 2. It is a program of artistic residences that was created last year in which we invited eight artists from Latin American countries to come to Constitución, in the Maule region. This is during a week in which in the first two days there are activities to make the city known to the artists, with guided tours through different parts of the city and then workshops or talks by the artists, as well as production and exhibition of works. What is the contribution of Raco to Constitución? At least here is not much this dynamic mainly because the residences that are made are rather presentation and for us in Cambalache producer is super important dialogue with the community, with the viewer, then all activities are open to the public to that can generate that dialogue or ask, because we know that there is a lot of misinformation about artistic work, lack of audience formation, then, that is why it is important for us to give these instances of interaction. Why that emphasis in the self-management? Basically because it is an interest of the group that carries out this activity, we started it last year only with local commerce sponsors, restaurants, bookstores, hardware stores; to whom we request materials because we know that it is suddenly easier to donate things from your business than money, then we look for financing and we do it from the will to do it, there are no salaries. Where did this Cambalache initiative come from? 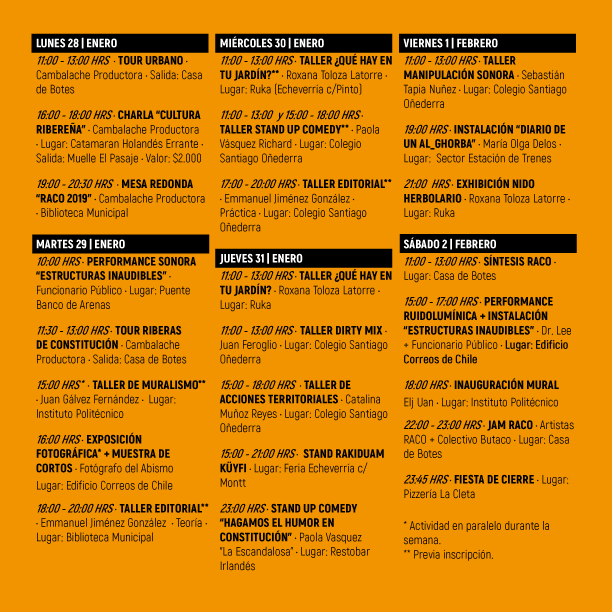 The production company has a short time, about two years, and last year we made the first version of Raco, the producer works from here in Constitución and its objective is to promote decentralization, generating artistic instances of both exhibition and training in Constitution and in places that are far from the urban centers, for example, here we are two hours from the city of Talca where most of the cultural activities take place in the region, and in the country most of the activities take place in Santiago , in the Metropolitan region, or in Valparaíso or Concepción. We ask ourselves whether contemporary art can be made and worked from the periphery, from rural or remote areas and this is what we have been doing through theater tours, and other research, we work from a decentralized area and in spaces that are not conventional as schools. What are your expectations about this activity? This is generated with the motivation of the artists who come from several cities in Chile and Argentina, who want to decentralize the development of artistic activity, so we hope that it will be liked by the people and that they participate so that they continue making this kind of activities. All activities are open and free, except those that correspond to the payment of some passenger transport in the city. The workshops have no prerequisite but have limited places, so it is necessary to register in advance to the mail racoresidencias@gmail.com or in this link.